Helps Incontinence Associated With Prostate Problems. Traditionally used to help support inflammation, bladder irritations and infections, urethritis, stomach disorders and more. Buy 1 for $13.04Buy 2 / Save $0.70!Buy 3 / Save $2.61! 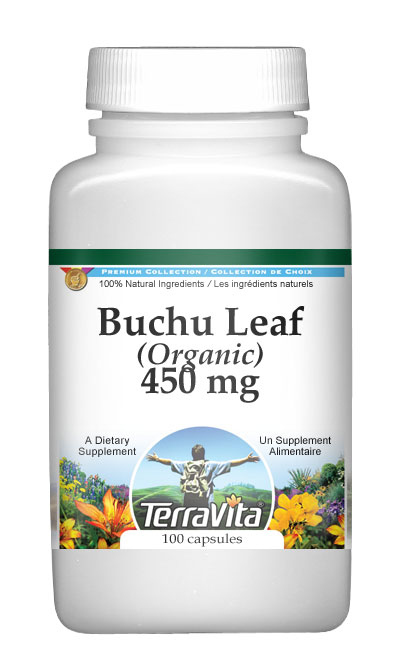 Pungent buchu leaves affect the bladder, stomach, and lungs. They are useful for the potential to help support symptoms of symptoms of complaints such as cystitis and urinary infections. This is due to the diuretic, stimulant, aromatic, carminative, and diaphoretic actions exhibited by the herb. The biochemical constituents of buchu leaf include and essential oil with barosma camphor. Buchu leaves are one of the best diuretics known. The herb originates in South Africa where it is commonly used by the Hottentots. It can be used to help support acute and chronic urinary disorders, including inflammation of the urethra, nephritis, cystitis and catarrh of the bladder. As with most diuretics, buchu works better if it is taken as a cool water infusion. Since it is commonly combined with uva ursi, for urinary infections, it is worth noting that neither of these herbs should be subjected to boiling as this dissipates their active principles and volatile oils. When given warm it is a stimulating diaphoretic useful in supporting enlarged prostate and irritation of the urethra.